In one of many sermons to the Saints regarding Joseph’s work and mission, President Brigham Young testified: “I feel like shouting Hallelujah, all the time, when I think that I ever knew Joseph Smith, the Prophet whom the Lord raised up and ordained, and to whom he gave keys and power to build up the Kingdom of God on earth and sustain it” (DBY, 456). Throughout his life as a Church leader, he expressed love and admiration for the Prophet Joseph Smith: “I can truly say, that I invariably found him to be all that any people could require a true prophet to be, and that a better man could not be, though he had his weaknesses; and what man has ever lived upon this earth who had none?” (Brigham Young to David P. Smith, 1 June 1853, BYP). President Young’s lifelong conviction of the Seer and his work was confirmed at his deathbed in a final expression of recognition and anticipation: “Joseph, Joseph, Joseph” (LSBY, 362). The Prophet Joseph Smith laid the foundation of the Church of Jesus Christ in this dispensation. It was decreed in the counsels of eternity, long before the foundations of the earth were laid, that he, Joseph Smith, should be the man, in the last dispensation of this world, to bring forth the word of God to the people, and receive the fulness of the keys and power of the Priesthood of the Son of God. The Lord had his eyes upon him, and upon his father, and upon his father’s father, and upon their progenitors clear back to Abraham, and from Abraham to the flood, from the flood to Enoch, and from Enoch to Adam. He has watched that family and that blood as it has circulated from its fountain to the birth of that man. He was fore-ordained in eternity to preside over this last dispensation (DBY, 108). [The Lord] called upon his servant Joseph Smith, Jr, when he was but a boy, to lay the foundation of his Kingdom for the last time. Why did he call upon Joseph Smith to do it? Because he was disposed to do it. Was Joseph Smith the only person on earth who could have done this work? No doubt there were many others who, under the direction of the Lord, could have done that work; but the Lord selected the one that pleased him, and that is sufficient (DBY, 460). How frequently it is cast at the Elders, when they are abroad preaching, that Joseph Smith, the founder of their Church and religion, was only a poor illiterate boy. That used to be advanced as one of the strongest arguments that could be produced against the doctrine of salvation, by the wise and learned of this world, though it is no argument at all. The Lord should have revealed himself to some of the learned priests or talented men of the age, say they, who could have done some good and borne off the Gospel by their influence and learning, and not to a poor, ignorant, unlettered youth. Not many wise, not many mighty, not many noble, speaking after the manner of men, are called; but God hath chosen the foolish things of the world to confound the wise, the weak things of the world to confound the things that are mighty; and base things of the world—things which are despised by the world, hath God in his wisdom chosen; yea, and things which are not, to bring to naught things that are, that no flesh should glory in his presence [see 1 Corinthians 1:26–29] (DBY, 321–22). I felt in those days [before joining the Church], that if I could see the face of a prophet, such as had lived on the earth in former times, a man that had revelations, to whom the heavens were opened, who knew God and his character, I would freely circumscribe the earth on my hands and knees; I thought that there was no hardship but what I would undergo, if I could see one person that knew what God is and where he is, what was his character, and what eternity was (DNW, 8 Oct. 1856, 3). What is the nature and beauty of Joseph’s mission? … When I first heard him preach, he brought heaven and earth together (DBY, 458). Joseph Smith has laid the foundation of the Kingdom of God in the last days; others will rear the superstructure (DBY, 458). I never saw any one, until I met Joseph Smith, who could tell me anything about the character, personality and dwelling-place of God, or anything satisfactory about angels, or the relationship of man to his Maker. Yet I was as diligent as any man need to be to try and find out these things (DBY, 458). He took heaven, figuratively speaking, and brought it down to earth; and he took the earth, brought it up, and opened up, in plainness and simplicity, the things of God; and that is the beauty of his mission. I had a testimony, long before that, that he was a Prophet of the Lord, and that was consoling. Did not Joseph do the same to your understandings? Would he not take the Scriptures and make them so plain and simple that everybody could understand? Every person says, “Yes, it is admirable; it unites the heavens and the earth together,” and as for time, it is nothing, only to teach us how to live in eternity (DBY, 458–59). I honor and revere the name of Joseph Smith. I delight to hear it; I love it. I love his doctrine (DBY, 458). What I have received from the Lord, I have received by Joseph Smith; he was the instrument made use of. If I drop him, I must drop these principles; they have not been revealed, declared, or explained by any other man since the days of the Apostles. If I lay down the Book of Mormon, I shall have to deny that Joseph is a Prophet; and if I lay down the doctrine and cease to preach the gathering of Israel and the building up of Zion, I must lay down the Bible; and, consequently, I might as well go home as undertake to preach without these three items (DBY, 458). There is not that being that ever had the privilege of hearing the way of life and salvation set before him as it is written in the New Testament, and in the Book of Mormon, and in the book of Doctrine and Covenants, by a Latter-day Saint, that can say that Jesus lives, that his Gospel is true, and at the same time say that Joseph Smith was not a Prophet of God. That is strong testimony, but it is true. No man can say that this book (laying his hand on the Bible) is true, is the word of the Lord, is the way, is the guide-board in the path, and a charter by which we may learn the will of God; and at the same time say, that the Book of Mormon is untrue; if he has had the privilege of reading it, or of hearing it read, and learning its doctrines. There is not that person on the face of the earth who has had the privilege of learning the Gospel of Jesus Christ from these two books, that can say that one is true, and the other is false. No Latter-day Saint, no man or woman, can say the Book of Mormon is true, and at the same time say that the Bible is untrue. If one be true, both are; and if one be false, both are false. If Jesus lives, and is the Savior of the world, Joseph Smith is a Prophet of God, and lives in the bosom of his father Abraham. Though they have killed his body, yet he lives and beholds the face of his Father in Heaven; and his garments are pure as the angels that surround the throne of God; and no man on the earth can say that Jesus lives, and deny, at the same time, my assertion about the Prophet Joseph. This is my testimony, and it is strong (DBY, 459). 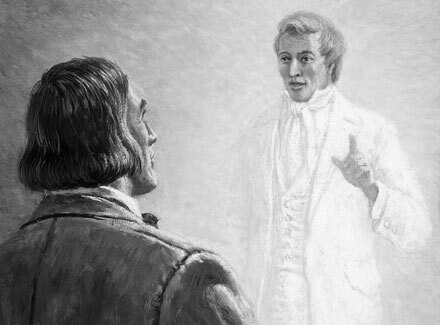 As portrayed in this painting, the Prophet Joseph Smith, after his death, appeared in vision to President Brigham Young. From the day that Joseph obtained the plates, and previous to that time, the Lord dictated him. He directed him day by day and hour by hour (DBY, 461). Joseph continued to receive revelation upon revelation, ordinance upon ordinance, truth upon truth, until he obtained all that was necessary for the salvation of the human family (DBY, 461). All the inhabitants of the earth are called of God; they are called to repent and be baptized for the remission of sins (DBY, 461). We have passed from one thing to another, and I may say from one degree of knowledge to another. When Joseph first received the knowledge of the plates that were in the hill Cumorah, he did not then receive the keys of the Aaronic Priesthood, he merely received the knowledge that the plates were there, and that the Lord would bring them forth. … He received the knowledge that [early inhabitants of the Americas] were once in possession of the Gospel, and from that time he went on, step by step, until he obtained the plates, and the Urim and Thummim and had power to translate them. This did not make him an Apostle, it did not give to him the keys of the Kingdom, nor make him an Elder in Israel. He was a Prophet, and had the spirit of prophecy, and had received all this before the Lord ordained him. And when the Lord, by revelation, told him to go to Pennsylvania, he did so, and finished the translation of the Book of Mormon; and when the Lord, in another revelation, told him to come back, into New York State, and to go to old Father Whitmer’s, who lived in a place opposite Waterloo, and there stop, he did so, and had meetings, and gathered up a few who believed in his testimony [see HC, 1:48–51]. He received the Aaronic Priesthood, and then he received the keys of the Melchizedek Priesthood, and organized the Church [see D&C 13; 20; 128:20]. He first received the power to baptize, and still did not know that he was to receive any more until the Lord told him there was more for him. Then he received the keys of the Melchizedek Priesthood, and had power to confirm after he had baptized, which he had not before. He would have stood precisely as John the Baptist stood, had not the Lord sent his other messengers, Peter, James and John, to ordain Joseph to the Melchizedek Priesthood. … And then [we] received other ordinances (DBY, 461–62). At this time  came a revelation that we could be baptized for our dead friends, but at first it was not revealed that a record should be kept of those who were baptized; but when he received an additional revelation to that effect, then a record was kept (DBY, 462–63). The Prophet Joseph Smith plainly taught the truths of the gospel. All that Joseph Smith did was to preach the truth—the Gospel as the Lord revealed it to him—and tell the people how to be saved, and the honest-in-heart ran together and gathered around him and loved him as they did their own lives. He could do no more than to preach true principles, and that will gather the Saints in the last days, even the honest-in-heart. All who believe and obey the Gospel of Jesus Christ are his witnesses to the truth of these statements (DBY, 463). The excellency of the glory of the character of Brother Joseph Smith was that he could reduce heavenly things to the understanding of the finite. When he preached to the people—revealed the things of God, the will of God, the plan of salvation, the purposes of Jehovah, the relation in which we stand to him and all the heavenly beings, he reduced his teachings to the capacity of every man, woman, and child, making them as plain as a well-defined pathway. This should have convinced every person that ever heard of him of his divine authority and power, for no other man was able to teach as he could, and no person can reveal the things of God, but by the revelations of Jesus Christ (DBY, 463). No man was to be found who could teach repentance and baptism for the remission of sins, with authority to administer in the ordinances, until God commissioned Joseph Smith, and sent him forth with his commandment to the people. Previous to that time, I searched everything pertaining to the churches; I searched high and low to find whether there was any such thing as pure religion upon the earth; I searched for a man that could tell me something of God, of heaven, of angels and of eternal life. I believed in God the Father, and in Jesus Christ, but I could not believe that the Church of Christ was upon the earth (DBY, 463). I might have continued to study the Bible and all the books that have been written, and without revelation from God I would have been like the sounding brass or tinkling cymbal, having no knowledge of God, of true religion, of the redemption of the living or of the dead; I would have lived and died in ignorance; and this was the condition of all the inhabitants of the earth (DBY, 463). Gentlemen, this is the great secret now in controlling this people. It is thought that I control them, but it is not so. It is as much as I can do to control myself and to keep myself straight and teach the people the principles by which they should live (DBY, 470). I recollect many times when Brother Joseph, reflecting upon how many would come into the Kingdom of God and go out again, would say, “Brethren I have not apostatized yet, and don’t feel like doing so.” Many of you, no doubt, can call to mind his words. Joseph had to pray all the time, exercise faith, live his religion, and magnify his calling, to obtain the manifestations of the Lord, and to keep him steadfast in the faith (DBY, 469). Now, as bad as myself and my brethren are, and as far as we are from the mark, and from the privileges we should enjoy, if Joseph Smith, Jr, the Prophet, could have seen the people in his day as willing to obey his voice, as they are today to obey the voice of their President, he would have been a happy man. He lived, labored, toiled, and worked; his courage was like the courage of an angel, and his will was like the will of the Almighty, and he labored till they killed him (DBY, 464). The Prophet Joseph Smith sealed his testimony with his blood. Many of the Prophets have sealed their testimony with their blood, that their testament might go forth with force. … As in ancient days, so in modern days. When Joseph Smith sealed his testimony with his blood, his testament from that moment was in force to all the world; and woe to those who fight against it (DBY, 467). When [Joseph Smith] went to Carthage he said, “I go to death; I go like a lamb to the slaughter; I go to my fate” (DBY, 467). Who delivered Joseph Smith from the hands of his enemies [until] the day of his death? It was God; though he was brought to the brink of death time and time again, and, to all human appearance, could not be delivered, and there was no probability of his being saved. When he was in jail in Missouri, and no person expected that he would ever escape from their hands, I had the faith of Abraham, and told the brethren, “As the Lord God liveth, he shall come out of their hands.” Though he had prophesied that he would not live to be forty years of age, yet we all cherished hopes that that would be a false prophecy, and we should keep him forever with us; we thought our faith would outreach it, but we were mistaken—he at last fell a martyr to his religion. I said, “It is all right; now the testimony is in full force; he has sealed it with his blood” (DBY, 469–70). His office is not taken from him, he has only gone to labor in another department of the operations of the Almighty. He is still an Apostle, still a Prophet, and is doing the work of an Apostle and Prophet; he has gone one step beyond us and gained a victory that you and I have not gained (DBY, 468). I know that [Joseph Smith] was called of God, and this I know by the revelations of Jesus Christ to me, and by the testimony of the Holy Ghost. Had I not so learned this truth, I should never have been what is called a “Mormon,” neither should I have been here to-day (DNW, 22 Oct. 1862, 2). What role did Joseph Smith’s ancestors play in preparing him to be the first prophet in this dispensation? In what ways has the faith of your ancestors influenced your life? What can you do to have a righteous influence on your posterity? What advantages came from the Lord’s calling a mere boy to lay the foundation of his kingdom in these last days? How does this help you to see the hand of the Lord working in your life? President Young said that the Prophet Joseph Smith laid the foundation of Jesus Christ’s latter-day Church and that others would rear the superstructure. What is that foundation? (See also D&C 5:9–10; 135:3.) What is the superstructure? What evidence have you seen that the superstructure of the Church is being built up? How can we all contribute to this work? What did President Young suggest was the “nature and beauty of Joseph’s mission”? How can we follow the Prophet Joseph Smith’s teaching approach in teaching our children and others? How did the Prophet Joseph Smith “teach us how to live in eternity”? How do these teachings apply to our lives in mortality? Why do you think the Lord reveals His truths “revelation upon revelation” rather than all at once? (See also D&C 93:11–14.) How was this true in the Prophet Joseph Smith’s life? How has it been true in your life? Why was the Prophet Joseph Smith such a beloved and influential teacher? What was his “great secret” for governing the Lord’s people? How can we apply this principle to our responsibilities at home, at work, and in the Church? How was the Prophet Joseph able “to obtain the manifestations of the Lord, and to keep him[self] steadfast in the faith”? How can we know the will of the Lord concerning ourselves? Why must we continue to be faithful in order to maintain our testimonies of the gospel? President Young stated, “I know that [Joseph Smith] was called of God, and this I know by the revelations of Jesus Christ to me.” How do you feel about the Prophet Joseph Smith? How can you appropriately share your feelings with your family, friends, and associates? Consider recording your feelings about the Prophet in some way for your posterity.